Assembly is the process by which part samples (belonging to the same assembly standard (RFC)) are connected to one another. Assembling two basic parts always results in a new, larger composite part that can be used in future assemblies. Assembly allows for the creation of parts that are longer and more complex in function, while still maintaining the format of the assembly standard. This idempotent assembly means that any newly composed part will adhere to its assembly standard without need for manipulation, and can be used in future assemblies without issue. Plasmid Backbone propagates a sample of a part, located in between the prefix and suffix of the plasmid backbone. As such the plasmid backbone dictates the assembly standard and assembly of that part sample. Part - A part is compatible with an assembly standard, as long as its sequence meets the requirements of said standard; this means that the part does not have any internal restriction sites that would interfere with the assembly, also known as illegal restriction sites. It is important to remember that a part does not include the prefix and suffix as defined by the assembly standard. Choose your method and assemble your parts with a variety of assembly technologies. You can use 3A Assembly, synthesis, Gibson, and more. Support the standard. Although, the Registry supports several standards, BioBrick RFC is the Registry's current de facto standard; all part samples submitted to the Registry must be BioBrick compatible and in the shipping plasmid backbone, pSB1C3. Standard parts ensure that the Registry can maintain and test all new parts in the same way. Registry members can easily and reliably use and assemble these parts in the future. Standard parts can be moved from one plasmid backbone to another for operation, assembly, measurement, and shipping. 3A Assembly (which stands for three antibiotic assembly) is a method for assembling two part samples and selecting for correct assemblies through antibiotics. 3A assembly uses the restriction sites on the prefix and suffix to assemble part samples. This new composite part will maintain the same prefix and suffix as its "parents" and contain a scar, where the cut and re-ligated restriction sites were stitched together. It uses effective antibiotic selection to eliminate unwanted background colonies and eliminates the need for gel purification and colony PCR of the resulting colonies. In theory, about 97% of the colonies should be the desired assembly. Additionally, the Registry has been providing iGEM teams and Registry labs with linearized plasmid backbones to further improve this assembly method. Higher success rate compared to Standard Assembly. 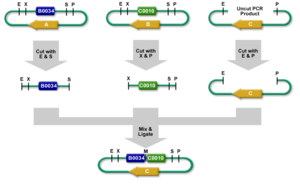 Type IIS restriction enzymes, like BsaI, cut DNA outside of their recognition site. This allows for custom overhangs, unlike normal restriction based enzymes (EcoRI cuts at its recognition site creating the same overhang every time). Type IIS assembly methods, such as MoClo, use this to their advantage. Parts will have the same restriction enzyme but distinct custom overhangs, so multiple parts can be assembled at once (one pot assembly). Type IIs assembly requires careful planning and preparation to ensure the multiple parts will assemble properly and in the correct order. Assembly standards like MoClo, help make this process easier by standardizing part. Currently, the Registry is evaluating MoClo, to support it as another assembly systems. There are assembly methods which also allow for the construction of composite parts without scars or specific linkers, which is particularly useful for the assembly of proteins. Additionally, these methods may be able to circumvent assembly standard incompatibility between part samples: a part sample in a Silver RFC plasmid backbone can be assembled with a part sample in a Berkeley RFC plasmid backbone. Just as DNA synthesis can be used to construct a new basic part, it may also be used to assemble parts together. Using the Registry database you can pull the sequence for parts you're interested, put them together in series, and then send the new composite sequence off to be synthesized. See the DNA synthesis page for more information and our offer with IDT. Gibson Assembly has not been tested by the Registry yet, but several teams have had success with this assembly method. The Cambridge 2010 iGEM Team developed a set of protocols and tools that may be useful. The Registry will be evaluating Gibson Assembly, and will have resources available for this assembly method available soon. For Standard Assembly, a part sample is cut out from its plasmid backbone and inserted into the prefix of a plasmid backbone of another part. Two restriction digests are done, one for the part sample that will be moved and one for the plasmid backbone that will receive it. The digests are then run on a gel and using gel purification the required fragments are isolated (the part sample and the cut plasmid backbone). 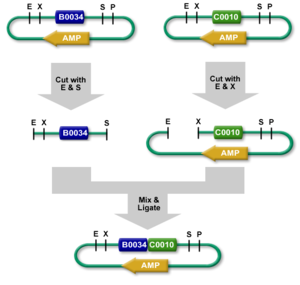 The purified insert and cut plasmid backbone are ligated and the resulting composite part can be transformed into E.coli cells. Due to its use of gel purification and lower success rate, the Registry no longer recommends the Standard Assembly method.